Union Mutual of Vermont, the central Vermont-based insurance provider, has signed on to be the presenting sponsor of the 2015 Special Olympics Vermont Summer Games. This annual competition event will be held May 29-31st at the University of Vermont’s athletic complex and the Williston recreation fields. Summer Games is the largest and most visible celebration of Special Olympics Vermont athlete skill, determination, and sportsmanship. May 30-31st nearly 500 athletes will compete in track & field, aquatics, and bocce at the UVM athletic complex, and softball at the recreational fields in Williston. In addition to competition events, athletes will have access to free health screenings through the Healthy Athletes Program, family activities, and social events throughout the weekend. During the day on Saturday, Union Mutual representatives will host Olympic Town, providing activities, games and prizes for athletes and their partners when they’re not competing. Union Mutual volunteers will also be on hand throughout the weekend to assist with Awards Ceremonies, running the bocce competition venue, and hosting Olympic Town. Prior to Summer Games, Union Mutual employees will participate in the Unified Relay Across America (URAA), a relay event that will unify the nation as it delivers the Flame of Hope to Los Angeles for the 2015 Special Olympics World Summer Games. 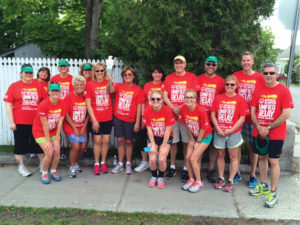 Vermont URAA relay segments will take place on May 26th in Montpelier, and 27th in Barre with a community celebration on the State House Lawn on May 26th at 5 p.m.